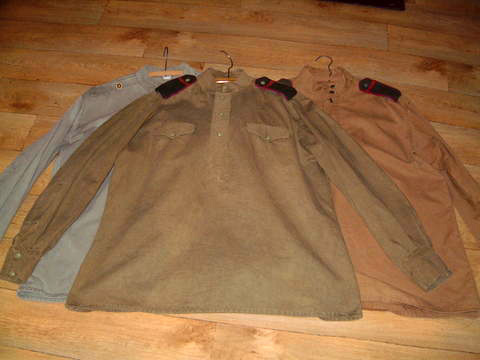 Tunic (Russian: gymnastiorka) – There existed 2 models of tunic for the Red Army in the Great Patriotic war: the M35 and the M43 patterns. The M35 featured a stand and fall collar where the branch insignia and rank insignia were displayed. This was a pull-over style closed by three buttons (which sometime would be covered by additional fabric) and a hook and eye at the top of the collar. The M43 stye harkened back to the uniform of the Czarist period which was based upon a peasant blouse. Like the 35 it was a pull over that closed with three front buttons. The collar was stand only and closed with 2 additional buttons. 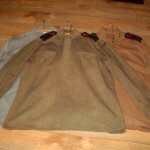 Initially the tunic was made without buttons for private soldiers and lower rank NCOs. However, this practice was soon discontinued and they began producing all tunics with internal pockets. All models are acceptable for men of any rank in the 3rd Rifle Division. 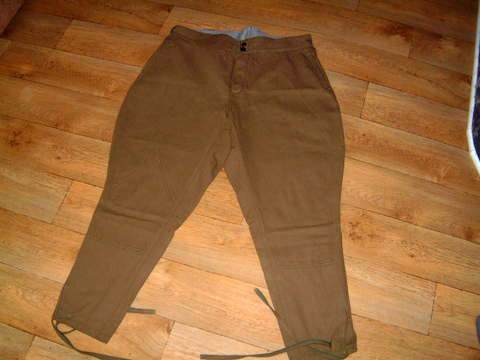 Breeches (Russian: sharovari) – The pants of the Red Army existed in 2 models as well. 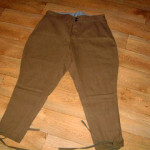 The Early war style to go with the M35 tunic were high-waisted pants that featured several buttons externally to support the use of elastic (or non elastic) suspenders. They featured a single back strap for adjustment, as well as knee reinforcements. The only way that the pants of the M43 uniform changes differed was that they were now shorter and could only use a waist belt. No suspenders could be used unless the soldier sewed in buttons. Both models payed tribute to the cavalry traditions of the Red Army with ballooning in the thighs. 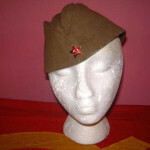 Sidecap (Russian: pilotka)- The standard headgear for the Red Army in this time was the pilotka side cap. The pilotka had two side flap which could be folded down. 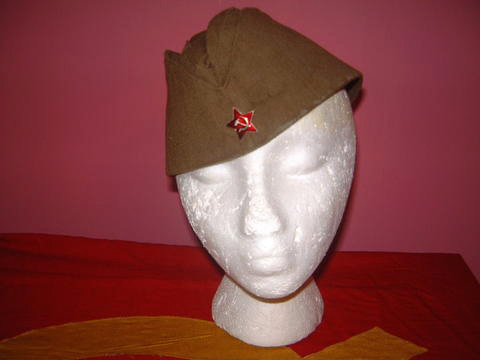 The pilotka was adorned with a single hammer and sickle star insignia which was either enameled or stamped and painted. 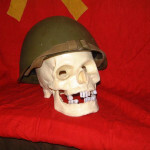 Helmet (Russian: shlem) – The standard issue helmet of the Red Army in the war was the M40 helmet. It was similar in shape to the US M1 helmet, but there similarities ended. IT featured a fixed 3 pad liner which could be adjusted by a single draw string. The chin strap was a web friction buckle strap. Please note: There is a Czech model of the M40 that was produced in the 1950’s. These are not acceptable as-is. The liner in the Czech models are similar to that of the German WWII liner and the chin strap is made of leather. 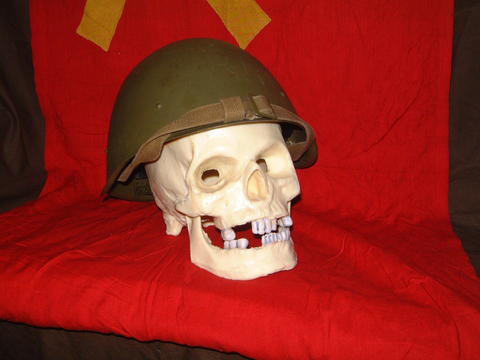 They can be converted to look like the M39 Soviet helmet, a pre-war model of the M40. 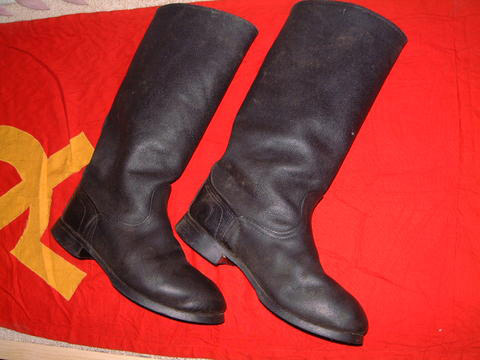 Boots (Russian: sapogi) – The boot used by the Red Army in the Great Patriotic War was a high topped jack boot. It featured a rubber sole, rough or smooth out leather lowers, and impregnated canvas uppers. 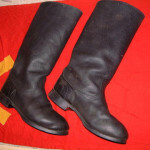 There are many post war boots available in various shaft heights. Post war VDV or paratrooper boots are not acceptable as they are a lighter material and feature a rivet in the back.